SPOILER ALERT! Don’t read below here if you don’t want to know what happened on The Curse of Oak Island Season 5 Episode 12. 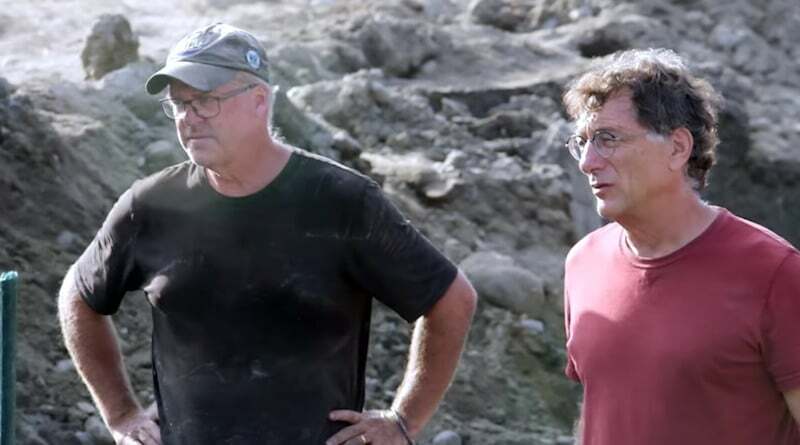 The Curse of Oak Island Season 5 is drawing to an close with just four episodes left — but there’s still time for a mega find! The latest episode, A Key to the Mystery, saw Rick and Marty Lagina and the team beginning the year’s final drilling efforts in the Money Pit area as the DMT caisson — named after Drake Tester — started its journey deep underground. A lot more information was also garnered about two of the biggest discoveries this season — the pieces of parchment, wood and apparent book binding found in the H-8 spoils, and the medieval cross discovered by metal-detecting expert Gary Drayton at Smith’s Cove. 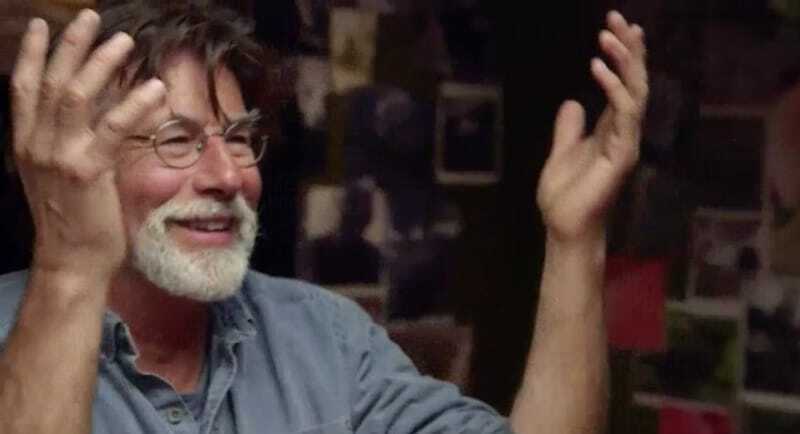 Here’s the 10 biggest things we learned from The Curse of Oak Island Season 5 Episode 12. The episode started with the team speaking to Jerry Glover — who previously showed Rick, Alex Lagina and Peter Fornetti around the Templar prison at Domme, France — on the phone. The medieval cross found by Gary earlier in the season had already been shown to resemble one of the carvings engraved in a wall at Domme by Templar Knights, possibly using their teeth. During the conversation this episode, Jerry also told them about similar graffiti in the nave of a 13th century church in a village called Whitchurch in Buckinghamshire, England. The interesting thing about that graffiti was that it included a date, 1416, etched into one of the nave’s pillars. Jerry said this showed “quite securely” that that was the latest date the graffiti could have been made. This could possibly suggest the cross itself — which he described as having a “13th century look” — was also from a similar era, but more research would need to be done before that could be confirmed. Jerry said the type of cross found, commonly known as a “mortuary cross”, could have been worn in Christendom by anyone from an ordinary person to a knight or a clergyman — often to try and ward off disease. Could the cross still be a Templar one? Yes. Can we say so for sure? No. Rick said the team would consult more experts to get a definitive answer. 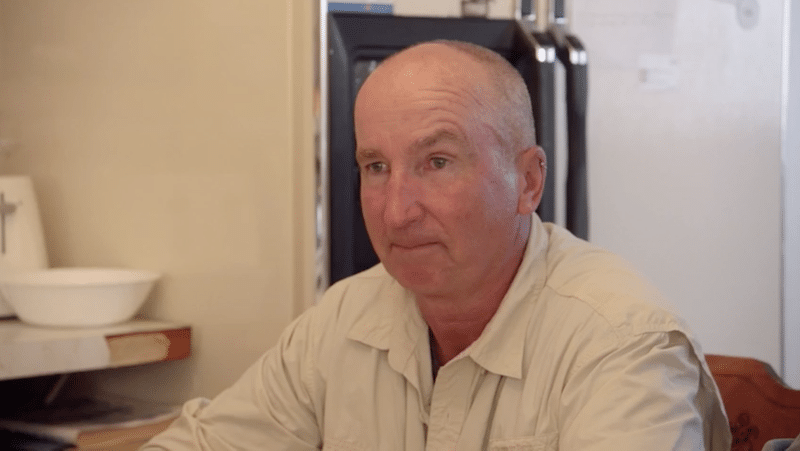 Fred Nolan was evidently absolutely convinced there were secrets hidden on Oak Island — as the legendary treasure-hunter’s maps show. The episode saw Rick and Charles Barkhouse head to Waverley, Nova Scotia to meet with Fred’s son Tom, where they agreed to work together going into the future. Tom then brought out his dad’s maps, which he granted the team access to moving forward. To say they are detailed would be a massive understatement. 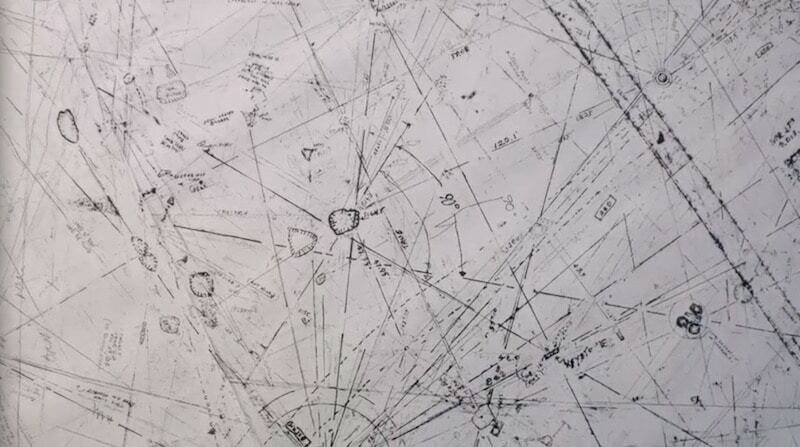 Fred was a land surveyor who became interested in the Oak Island mystery when asked to create a detailed map of all 140 acres of the island for MR Chappell in 1961. He proceeded to buy six four-acre lots in 1963 then spent half a century plotting evidence of possible man-made markers, and made several significant discoveries including so-called Nolan’s Cross. His maps include every survey line he ever drew, and there are literally hundreds if not thousands of them. The problem? Fred passed away in 2016 so there is no longer anyone who can interpret exactly what every line means on the map. One particularly interesting discovery made by Fred were what he believed to be the original survey markers used to create the boundaries of the Oak Island swamp — which he strongly believed was an artificial body of water. 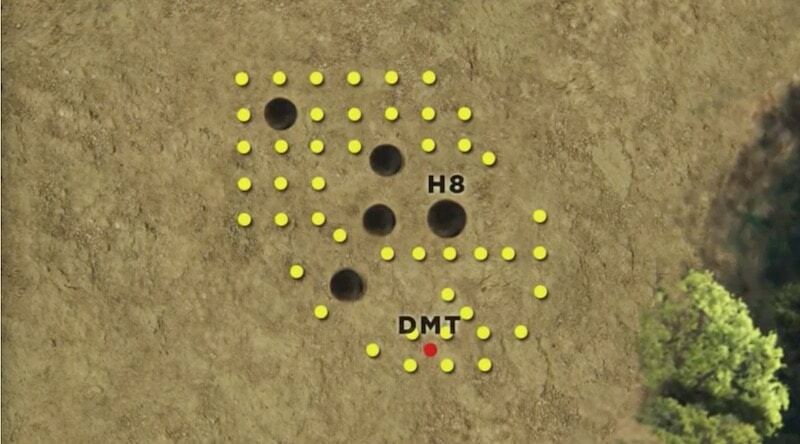 Could one of these markers be what Rick pulls out of the swamp next episode? Apparent man-made markers were not the only interesting things Fred found on the island. 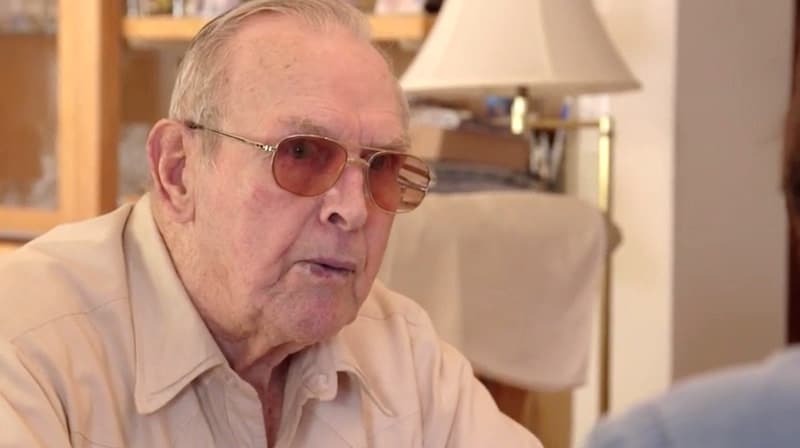 During their meeting, Rick and Charles Barkhouse were handed a mysterious skeleton key by Tom Nolan which he said his father had discovered on the island. He says he doesn’t know where exactly Fred found it, but it has a distinctive cross in the bit (the part you put in the lock) which can be seen in the handle when you fold the key, as shown above. Skeleton keys were also known as pass-keys, and we learned how their use dates back to the 8th century BC. They were often used as universal master keys that could open and closer various locks on everything from doors to safes, or as a pick for thieves who wanted to break into them. 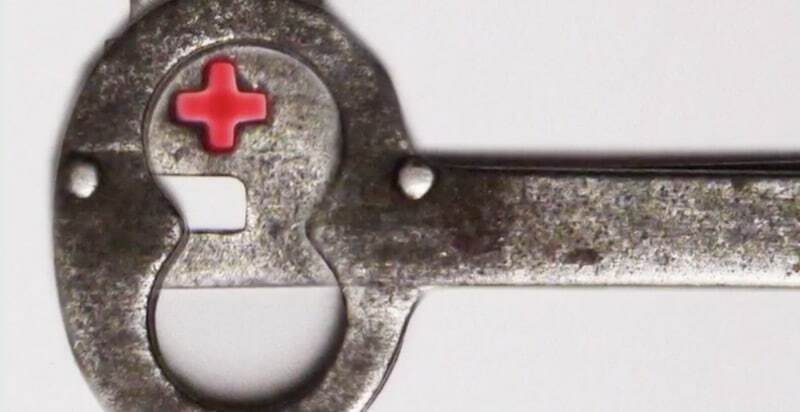 Earlier in Season 5 we saw several other keys surface while the team examined a chest once owned by privateer and Freemason Captain James Anderson. There are definitely a lot of unopened treasure chests lying about somewhere! 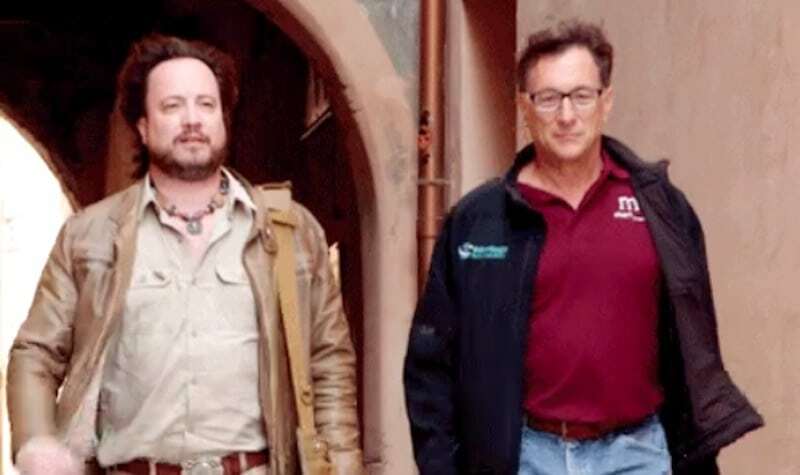 As well as giving them access to Fred’s maps, he also gave them access to all of his father’s 16 acres on Oak Island for the first time since his death. With the help of Tom’s associate Jim Meagher and a seven-ton backhoe, the team dug a 2ft trench in an area on Lot 12 which was identified from Fred’s maps as an “ancient dump site”. The site is an area where previous searchers reported finding evidence believed to be connected to the original construction of the Money Pit. 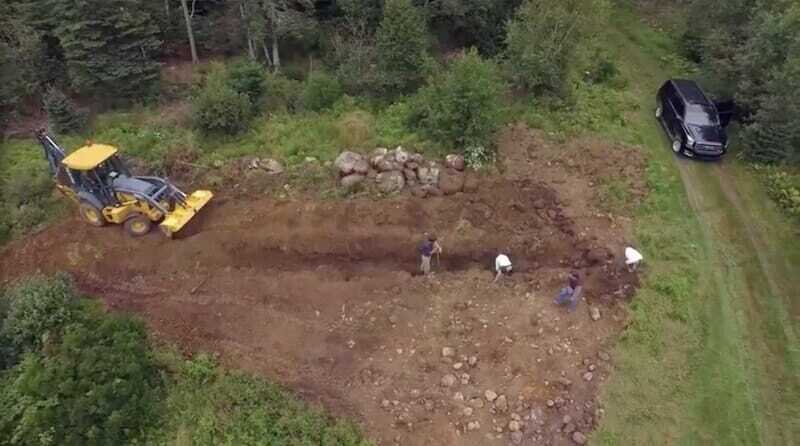 The good news is the Oak Island team look to have found the dump site on their first attempt. Things weren’t looking good initially, but then Charles suddenly spotted a few bits of pottery, which turned out to be practically “the whole dinner service”. In 1936, treasure-hunter Gilbert Hedden found shards of pottery in the dump site with traces of mercury in it. This is significant because Sir Francis Bacon, in his book Novum Organum, described a method of preserving documents in mercury, allowing them to be securely buried deep within the ground. As we learned on the episode, Bacon was a leading member of the Rosicrucians, who its thought may have come into possession of Templar treasures. Some also believe Bacon was actually the author of Shakespeare’s works. So finding mercury items from the Money Pit adds kudos to the theory that important historical documents could be buried there. It will be interesting to see if any of the new pottery has mercury on it, and what else they find at the dump site (See No. 9 below). The episode saw Alex Lagina and Jack Begley go to Dawson Print Shop at the Nova Scotia School of Art and Design in Halifax to talk to Joe Landry, an expert in medieval book binding who specialises in the study and restoration of ancient manuscripts. He immediately confirmed that one of the items the team found in the H-8 spoils earlier in the season was indeed parchment, while the pieces of leather they discovered he said were typical of a type of vegetable-tanned leather which can last thousands of years. However, the most interesting item was actually a fragment of purple wood also found in the spoils. Apparently its particular shade of purple was one that was only used in important church and royal documents. 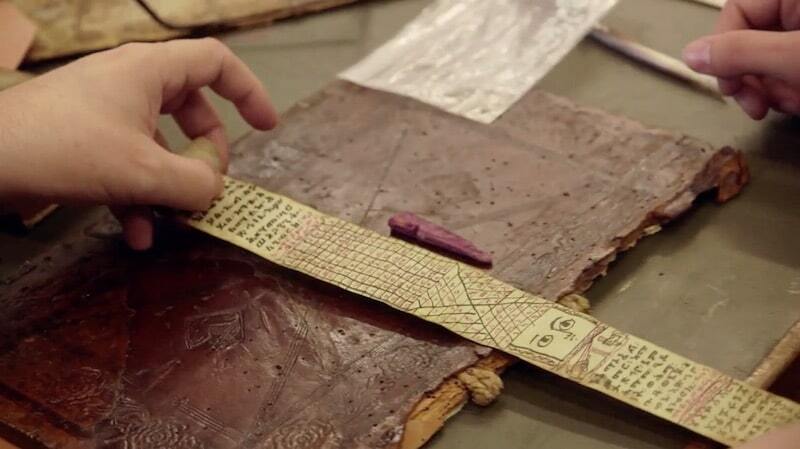 Joe even showed them a 2,000-year-old Egyptian scroll containing an almost identical-colored ink. How could the wood have ended up that color? Joe thought it possible that it had been part of a book board, and had been stained by leather it was previously bound in. 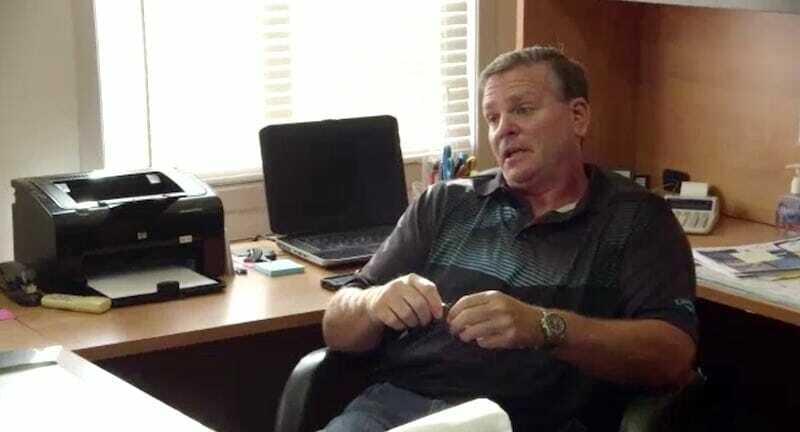 Dan Blankenship is an Oak Island legend, and when Rick and the team visit him to show him a discovery you know it’s an important one. 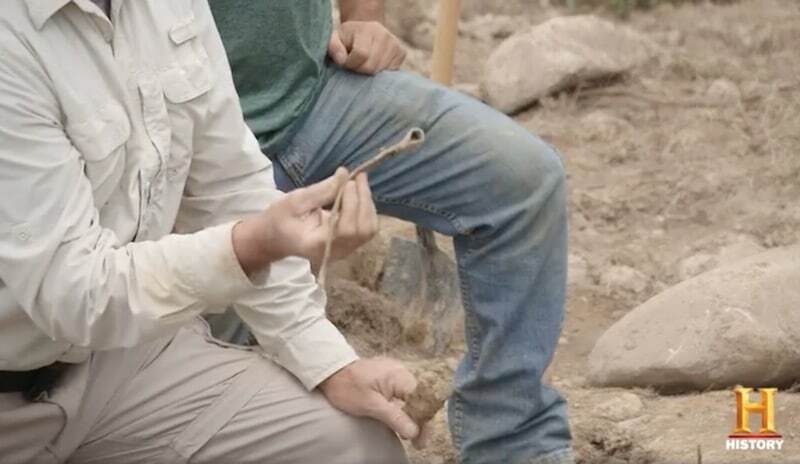 This episode saw Rick and Gary Drayton visit Dan to show him the medieval cross — and his expression after seeing it for the first time showed that he believed this was a really, really special find. 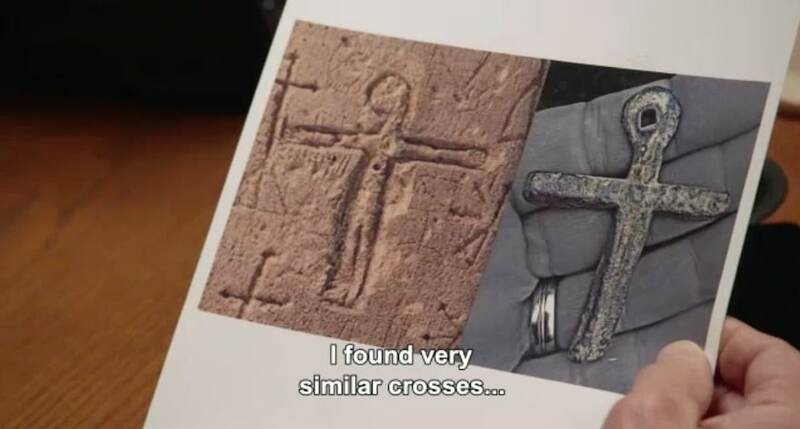 They also showed him a picture of the carving of a cross which Rick saw in the Templar prison at Domme, which Dan said had a “striking” similarity. Not much time was spent at the Money Pit area this episode, but that looks likely to change next week. The sneak peek for next week then saw Mike reveal the caisson had hit an obstruction, as something goes wrong with the oscillator and it starts pumping out oil. Could the obstruction be the Chappell Vault, which the team believe they somehow pushed out of the way or further down into the ground while digging the H-8 hole? The newly-released trailer for the episode also gives another glimpse at them. The last segment of the sneak peek showed the team speaking to Zena Halpern, who has previously featured on the show, about the medieval cross. And whatever she uncovers about it sounds very promising.